Our Custom Blends® roll your own tobacco offers a premium taste and big savings as compared to big tobacco cigarettes. The cost of commercial cigarettes is high and the quality is average at best. Check out our roll your own (RYO) tobacco blends for great flavor and big savings. 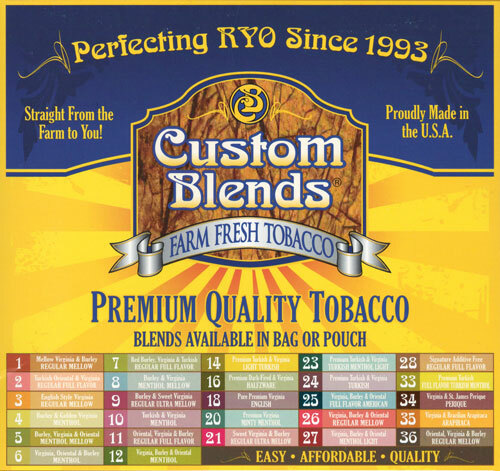 Planet RYO has dozens of custom tobacco blends that you can’t find anywhere else. Visit one of our 8 locations today, check out the quality and the savings. Custom Blends carries some of the finest roll your own cigarette tobaccos in the world! We have 27 blends, both menthol and non-menthol, so we’re sure we can offer the perfect smoke for you. Why is our tobacco better than every major brand out there? Because we choose our tobaccos carefully from farmer’s co-ops, smaller family operations, and from small overseas operations. By avoiding the big manufacturers you get to experience true tobacco and not the pre-manufactured, cost-cut, mass-produced cigarettes churned out by the huge conglomerates. We add no chemicals or additives to our tobaccos. They go to you as they come to us, without preservatives, or burn accelerants. Our tobacco doesn’t sit around in a warehouse for 6 months. Our Blends are all pure, whole leaf, shredded tobacco. The huge tobacco companies use reconstituted sheet tobacco, and short leaf tobacco. The huge tobacco companies add preservatives and other chemicals to extend their profit, not to deliver the true tobacco experience. 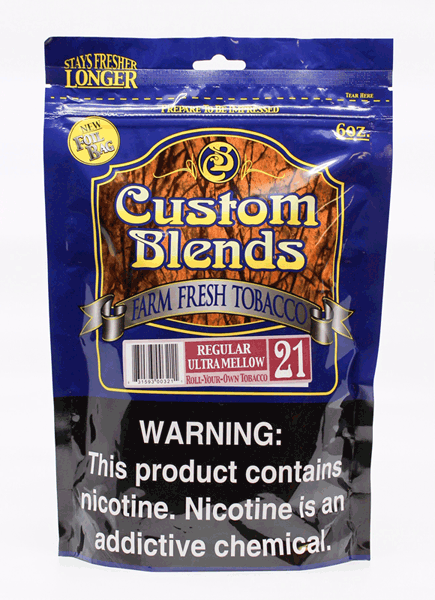 Custom Blends offers the true tobacco experience.